What are the 12 pages? Is that Marmalead ranking or something else? I have been using Google to clue me in as to what the first keyword or word in my title should be. Should it be the color of the hat, hat, or style of hat. Their numbers have been guiding me. I think the bucket idea is great but all of this is built on the 12. I meant to say the pages within Etsy search. If you can have your listing on every page, that’s gonna give you the maximum exposure. The idea is to do this on every keyword you use so you’d appear on every page, on every search. Love this idea just having a hard time figuring out how to do it for my product. I sell pillow covers and I do mostly french country or farmhouse rustic. Is pillow covers one of my buckets? then the style also another? Pillow covers might be too broad to rank on. But you can use this as one of your broad buckets. For targeted keywords, the easiest trick is to describe your item; the color, the style, the materials can be used as starting points. I didn’t think the order of keywords in tags mattered? Or are you talking about the order of keywords just in the title (which I know do matter). Yes thanks for pointing it out! That was a slight oversight. Yes I meant to tell order of the keywords in the title. Correct, tag order doesn’t matter (but it won’t hurt you either if you choose to tag them in the same exact order). Could you tell whether it is correct to duplicate the same product within Etsy about 12 times in order to grasp all thematical keywords (choose for each duplicate different title/tags/main photo and description)? Question: I make backdrop necklaces which is a very specific type of “bridal jewelry”. Should I still use “bridal jewelry” as a key word and tag toward the end of my title since I won’t EVER rank for that word anyway? Or maybe have some of them with “bridal jewelry” at the front just to switch it up? 2. It’s a good way to ‘at least’ try and give the broad markets a shot even though the chances of landing within the first three pages or so is small. I would try to use a different form of ‘bridal jewelry’ to use in front, something more specific. Etsy as we know, weighs keywords in the front heavier than the ones at the end and that alone is why you should not waste that space. I have a question: I noticed you used these two title keywords to your example: [gold starfish ring] [starfish ring]. 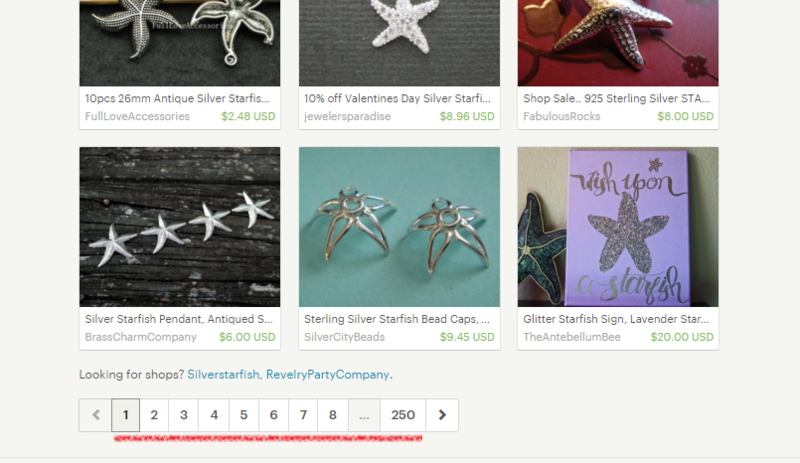 If someone types at etsy search “starfish ring”, won’t listings with the keyword “gold starfish ring” appear too? I mean is it a good idea to repeat a phrase which already exists in another phrase? Hiya! Yes if you search for ‘starfish ring’; ‘gold starfish ring’ has a chance of appearing in that search too. But so are other variations like ‘silver starfish ring’, ‘rose gold starfish ring’, and etc. would appear too. So it’s nice to have both the broad and narrow keywords for that listing if you have some extra tag space left. Is this strategies still work in 2018? It seem too different from what they talking in this topic.